Firstly, I would like to thank everyone for their best wishes on me getting better - it worked! I have turned a corner on the coldus/virus horriblus and I feel a lightening of the fogginess in my brain - I am a happy happy woman! Onwards and upwards, knitting conundrums and all. As you recall, #1 (My Stash) was dealt with on Tuesday. I am feeling the pride, unabashedly! Conundrum #2 Unfinished Objects I have unfinished objects - they stare at me in my 'knitting room,' and from the sidebar of this blog. I have contemplated removing them from the sidebar (as though somehow that would help me to remove them from my psyche). I have unfinished objects so close to being finished it is stupid! I also have unsewn finished objects which I have shown in the hopes that it would motivate me to sew them up - hasn't happened yet (but I think I am getting close!). I do have various UFO's (see sidebar - LOL) but here are a just a few (no one has that much time! ): Four Seasons Cardigan from Morehouse. 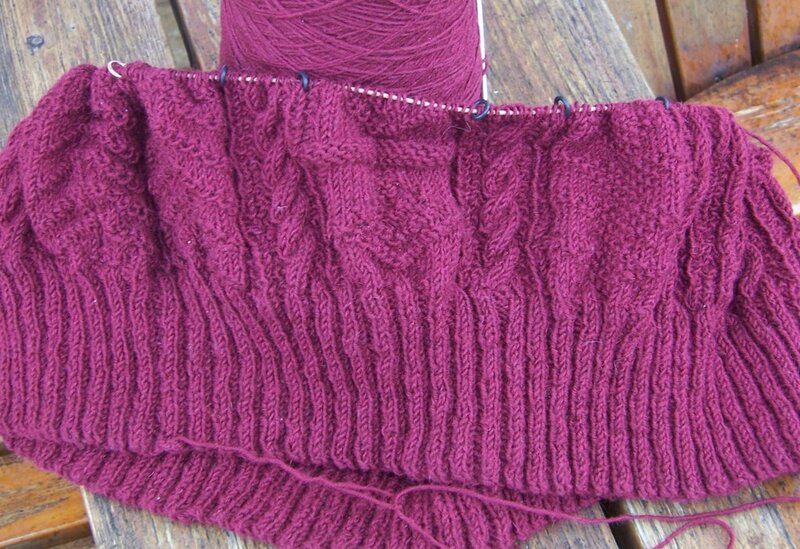 Thought it would be a breeze; solid knitting, top down and yet when I got to the sleeves couldn't get my tension the same again so I stopped. That string hanging out at the bottom looks like an umbical cord (which makes sense because this mommy still hasn't birthed this baby!). How long would it actually take to put in the sleeves - hours? A day? And there is like almost no sewing! Sundby from Noro. Possibly a worse indiscretion. It only took me about three days to knit the body (neck included for no extra pickups!) and all it awaits are the sleeves. 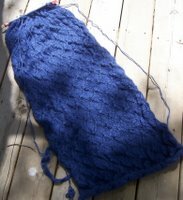 Bulky yarn, knits up quick, how long would it really take? A couple of days, minimal sewing and BAM! finished. Yet it sits and sits and I look and I look and it remains not finished. This is the Pewter Lace Shawl from Interweave Knits (Spring 2003). I had originally started this a couple of years ago to give to the Minister who was going to marry Ed and myself (we lived together for about 9 years before I agreed to the hand sweating ceremony). We eloped instead (after 10 years of living together; I never have been one to live conventionally). So the shawl is not finished - I think it is about halfway done and oh my God I know I should have just finished and maybe left the border (it's Lace - I have to go back and restart the Lace - aaagghhhh!). It is so beautiful and I so want to finish it but..... And here is Heartland from Jo Sharp. 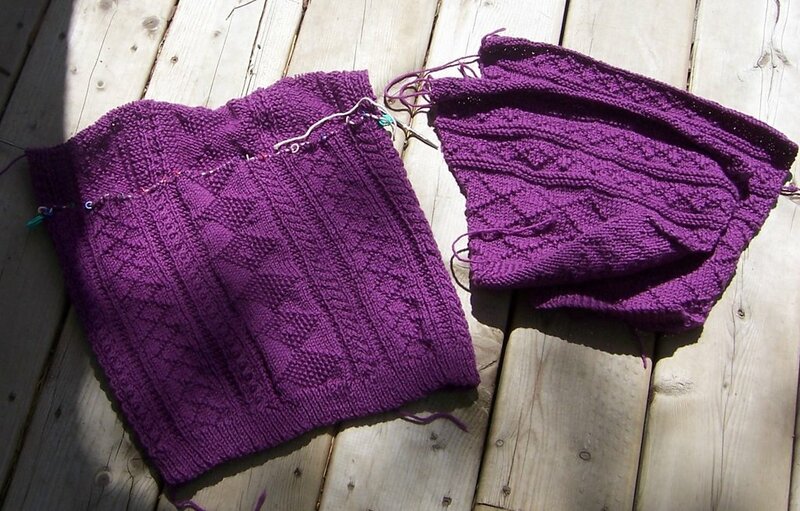 Look the sleeves are done on this one! This requires the finishing of the front and back from the armhole to the neck, about maybe 4 inches or so. 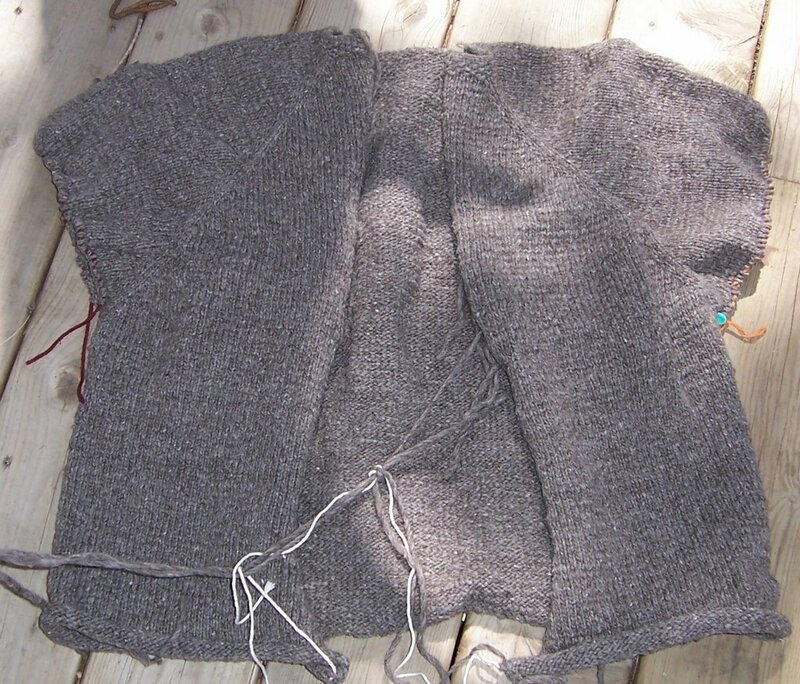 Again minimal finishing (3 needle bind off at the shoulders, pick up and knit the neck, sew in the sleeves). This conundrum is big. Clearly not much to do and yet I have not finished them (the list is relatively long and yet for the most part, most of these items are more than 50% finished). I have four theories. Do you remember when you were in school and you had a deadline for a paper or an essay and for whatever reason you missed the due date, and then once that happened, did you find your momentum going right down the toilet? This is one possibility but that would only apply to the wedding shawl. Another possibility - A.D.K.D. (Attention Deficeit Knitting Disorder) which is more akin to something that seems more exciting comes along and voila! easy to put down the current project. Maybe. Third possibility - fear. 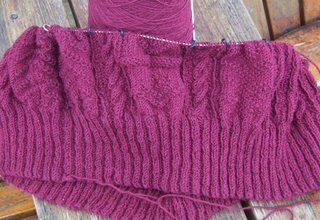 Can't get the tension right on that all in one cardi that seemed so easy and maybe it's not so if I avoid it, won't have to deal with it and feel really really stupid. Fourth possibility - my illness and the dumbing down fatigue that makes simple patterns, at times, absolutely impossible for my suddenly pea sized brain. That is definitely applicable to the Heartland sweater. But I hate using my illness as an excuse. I keep telling myself I should just take a month (or three), finish, sew, sew some more and mostly apply myself and all of this will be taken care of. That, or post my dirty laundry/knitting and shame myself into it. Conundrum #3 Stornoway I bought the real stuff. 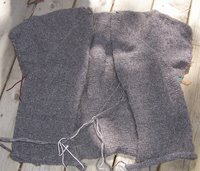 Real gansey wool all the way from England from the special sheep to knit a true Fishermen's Sweater (Alice Starmore). I even knit and blocked a swatch! With true excitement I started out on this beauty (for my sweet Ed). Of course I had to rip it out the first time because I had used the wrong size needle (forgot to switch after the rib!) I must now admit I hate knitting it. I would rather poke myself in the eye with a needle (not a Lantern moon but something less valuable). I hate the feeling of the gansey, I hate the fact that it is not soft, has little give and I knit and knit and knit with little progress. Perhaps in the future I will like the gansey. Perhaps I will have to visit Alice's website and buy what they suggest (although I have no guarantee that it will be softer). At any rate, and because I do not want yet another UFO, by the time you read this I will have ripped (I will not use the PC term frog because I really want to rip) this puppy out. In it's place (and this is where having a jugemongous stash certainly helps) I have started Anjuli by Jo Sharp. I am loving it! Garter stitch, so it doesn't matter how foggy my brain is, with colour changes. The wool is full and springy and feels so wonderful in my hands. The pattern, tres tres simple. I was not sure about the colours at first but they are growing on me. I will not think about the sewing (although I think sewing 5" squares will give me a better affinity for it!). Conundrum #4 My Sockapaloooza Socks See that yarn and that pattern? These are supposed to be my Sockapaloooza socks. Unstarted as of Tuesday. Due to be mailed on May 2nd (next Tuesday). Way back when, oh before the Olympics, I was thinking lots of time, tons of time. I'll start them after the Olympics. No problem. Didn't count on being tired after that little event. Didn't count on starting the Grace Project and being derailed by my ongoing program at the clinic and feeling overwhelmed. Didn't count on being sick for a month. Lesson here: start earlier. Don't count on life flowing smoothly. I did finally cast on on Tuesday afternoon. It is the magic loop method, toe up. Damn, the yarn is fine and the needle is small. This will be a miracle akin to turning water into wine. I was feeling hopeful on Tuesday, figured if I got into the leg by Thursday I could put these puppies to bed easily in time to be mailed by Tuesday. I am now starting to sweat. It is Thursday and I am not at the heel yet. I am still believing that I can do this. I plan to knit like a fiend (don't have to go to Toronto again until next Thursday so my calendar is clear) and get these done. I have a HUGE Warming Grace post to do but I will plan to do that on Saturday so I can try to get sock one done and have sock two underway. I will solve this conundrum anyway. At least this one! Nose to the grindstone girl. You just have too much on your plate. OMG. You have so many projects to do! I feel a little envious. I am trying to finish my Ravenclaw Raglan and I have had so many frickin work meetings this week. AND it is early dismissal day so we have 19 kids from 2 pm til 6 pm. I have got to be getting my period too because I am snappy, impatient, frustrated and intolerant! Isn't that nice for those children!! I am going to try to say as little as possible. Eat some chocolate and maybe go for a walk or something. This is baaaddd. Anyways! That has been interfering with my knitting. I can only imagine the level of interference you have when you are unwell. Good for you for slugging on! Those socks are going to be beautiful. Finish them for Tuesday (without killing yourself!) and then move onto something that you LOVE. Your wips will wait. That is what they do best! That's a lot of wips but they are all beautiful. Just remember knitting is supposed to be fun not work! Good luck with the socks they are beautiful. Hey Cynthia, I love the Anjuli and the socks too. I do not envy you the knitting though. Hope you can do it! Good luck on the socks!! Are you into knitting podcasts yet? I find that a great thing to listen to while I'm knitting because you're being entertained but also encouraged to keep knitting. The new episode of Cast-On is already up, yay! You're making me nervous with the sockapaloooza socks and I'm not even participating. I do however love the pattern you chose. What yarn pray tell did you decide on? And the Morehouse sweater -- if the sleeves bother you THAT much, tension, schmension, etc. can you make it a vest? The Starmore sweater is gorgeous. But if you ain't feelin' it you ain't feelin' it. The good news is that aside from the socks which are an immediate priority, you have all spring and summer to tackle some of these and have them done for cold weather wear. Wips are like a fine wine, let them age properly and their time will come. 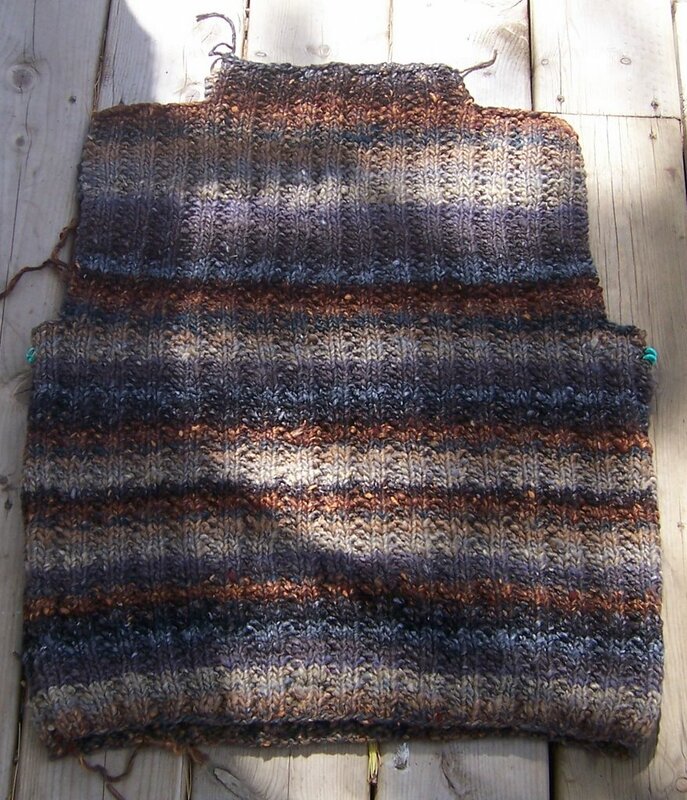 I have a sweater I've been working on for over 10 years. I'm just about done with the body. It has gone in and out or style twice (like that would matter to me) It will be done someday - maybe. If not I've still enjoyed the process and that's what this is all about! I'm probably not going to be much help because I have issues with UFO's. 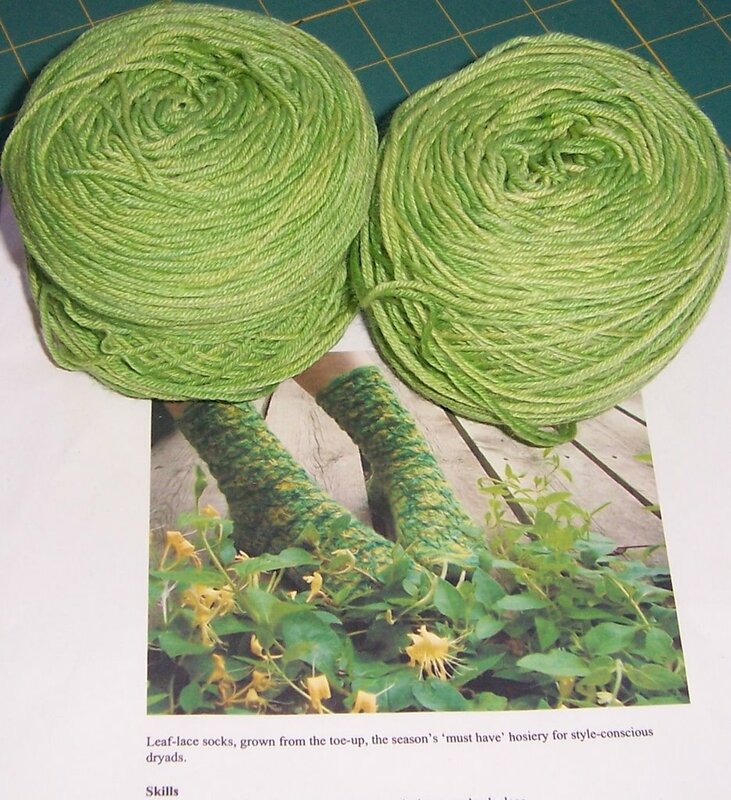 They must be finished (if you visit my blog you will see a pair of embossed leaf socks finished in two different colors yarn because I couldn't wait for the LYS to get more of the same color Lorna's Laces in.) So I think you should just pick up a project, don't think about which one, and just start finishing. You will feel better. On the sockpal socks, you can always overnight them if you need a couple of extra days. Might cost a pretty penny, but then you wouldn't get on The List. They're beautiful, by the way. As for the other things, just pick the one that's closest to completion and work on it. Like paying off credit cards. Yeah, that's it. The buzz you feel from finishing one will carry on to the next one, and you'll feel even better. Oh, the socks will be so, so pretty. To bad you won't have time to linger over them and enjoy the proccess. I HATE deadlines, and have swone off knitting on a schedule for the most part. If we do it because we enjoy it, we should make every minute enjoyable, no? Don't feel bad about your socks. I had one finished before I did something to my wrist. 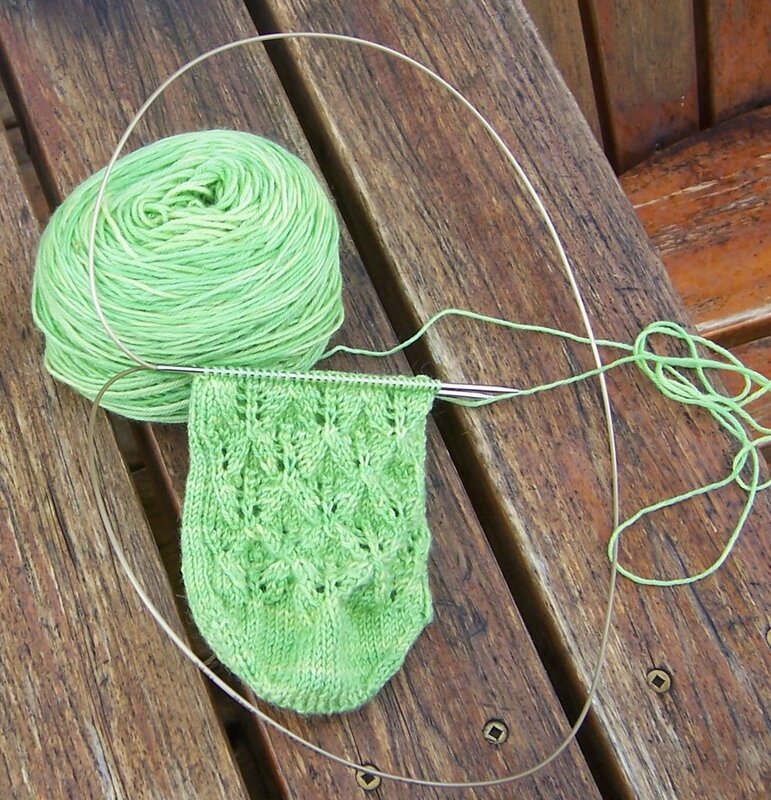 I am getting together a pacakge to send to my pal so that she will have something to open while I finish the second sock. I have to say that I love the colors in your socks! Please read my post on Cindy's Tuesday blog. I am also known as Pink One. 1 - I know you can do it. 2 - If it takes a few extra days, I'm sure your sock pal will understand given how much has been going on. As Mum would say, "Sweat pas, m'dear." Hang it there! There's no rush to finish anything. It's a hobby, remember? 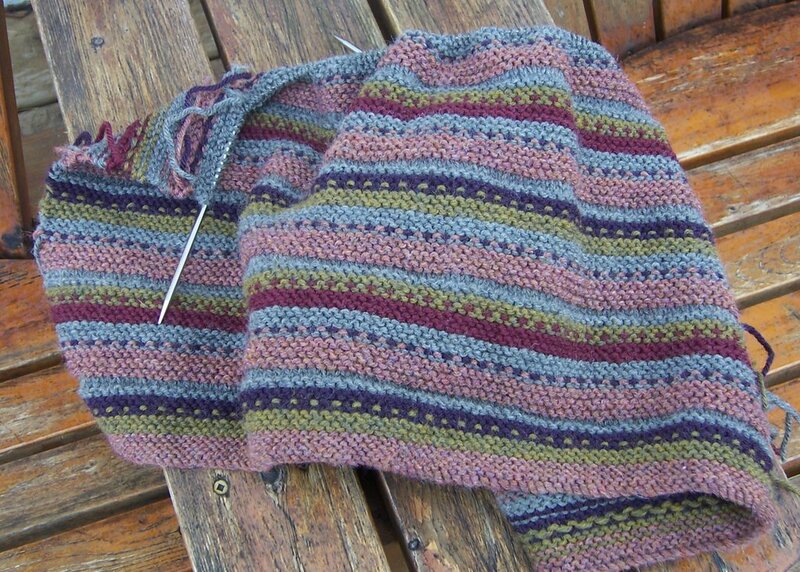 I have to say I'm mildly heartened to hear that you haven't finished your sockapaloooza socks either. I, however, do not share your optimism about finishing in time to mail on Tuesday. I am leaving you this little note to let you know that your socks are underway (I'm ready to start the toe decreases on sock one), and not to worry when they don't materialize quite on time. And here I was worried about all I had on the needles. You win, you win! Good luck with your Sockpal socks!! Well I do see that you're much better under pressure ... got your socks done in spite of the time CRUNCH. So there's your problem all right. You need PRESSURE. So when the blankets are finished, let's have a "Finish our UFO's competion" or something like that. We photo all that we have to finish (stating what needs to be done on each) & then see how many we can finish is 2 weeks (for instance) ... new projects can not be started during that time. Only WIP's get completed. Something to think about and get you back into sewing up right? Never mind how this will give you more room for STASH. Lol ... we'll talk about it.